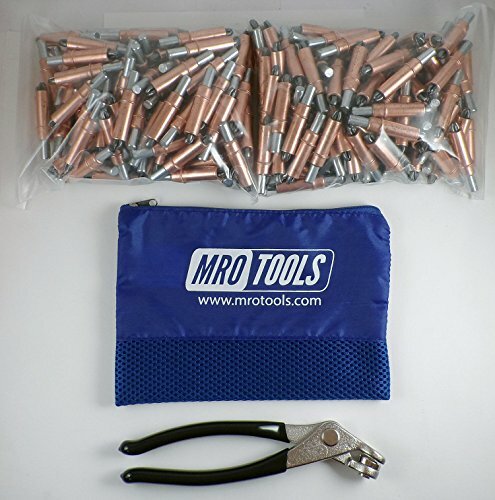 450 PC 1/4" Cleco Sheet Metal Fasteners plus Cleco Pliers This Cleco set comes with a durable, polyester zippered carry bag (6'' H x 8.5'' W) This listing includes 450 1/4'' Cleco Fasteners and one set of Cleco Pliers (see technical specification below) Standard (K) 0-1/4'' grip plier operated Cleco fasteners. The plier-operated (K) series sheet holder clamp is the standard temporary fastener solution. These spring-loaded and steel bodied fasteners are dedicated to light clamping forces (No more than 25lbs.) and are a simple, plier-actuated, inexpensive, alternative to competitive fasteners. A cleco fastener (also spelled cleko), also known as a skin pin, is a fastener developed by the Cleveland Pneumatic Tool Company. Cleco fasteners are widely used in the manufacture and repair of aluminum-skinned aircraft and in automotive repair, where it is used to temporarily fasten multiple sheets of material together before the pieces are permanently joined. Cleco Fastener Technical Specifications: Color: Copper Diameter: 1/4'' Drill Size: 1/4'' Equivalent Part Numbers: Zephyr: K1/4 Monogram: M1/4 Martin: MM43OM6 USATCO: 04M1/4 ATI: AT556M ATS: K1/4 Cleco Pliers: Cleco pliers are specially designed for installing spring-loaded temporary fasteners. A specially designed ''body seat'' holds the fastener in place while the plunger is depressed. These nickel-plated or black-oxide coated pliers are constructed of forged steel, thus resisting wear, abuse, and corrosion.